Hope everyone is still staying all warm and cozy through this long winter! 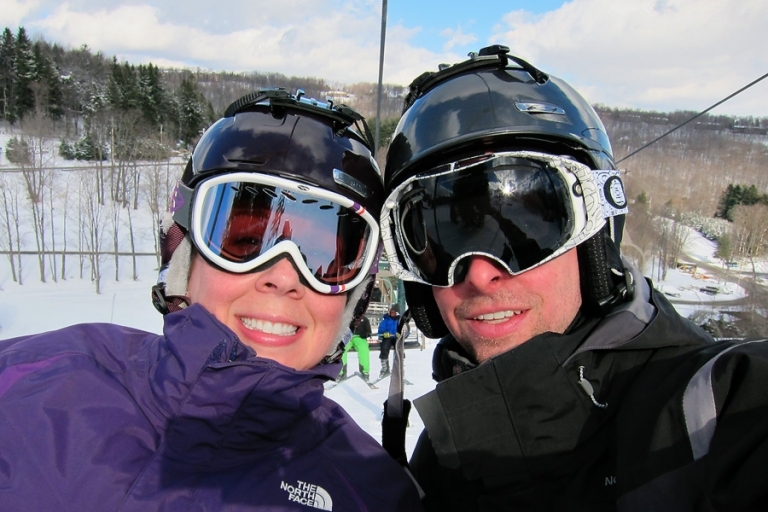 Chris and I just returned from a quick trip to Seven Springs in Pennsylvania where we broke in our new skis and enjoyed playing on the snow. 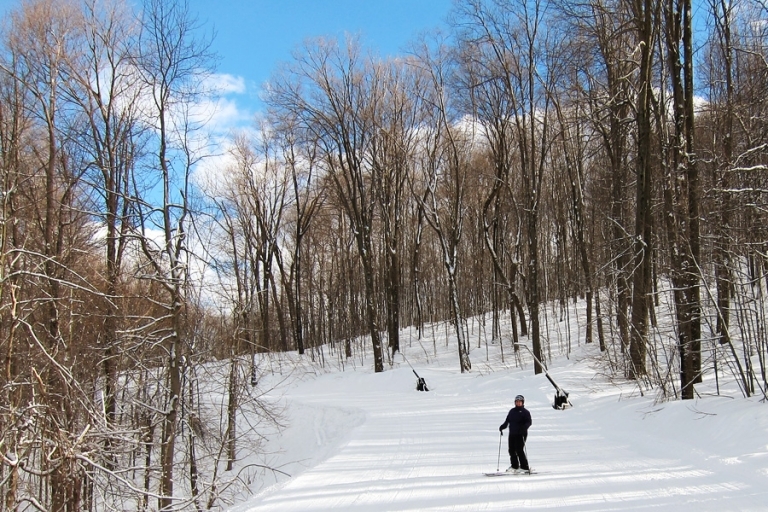 We decided to go during the week rather than on a weekend so that we could practice skiing with fewer people on the trails. Hardly anyone was at the resort, and we really did have the place pretty much to ourselves so we felt like that was a good call! The drive up was so beautiful, and the mountain was also really lovely. We stayed at a cute condo with ski-in/ski-out access, and were able to get in lots of practice. So now that I’ve skied a few times after spending the last two seasons learning how to snowboard, I think I can say with confidence that skiing is much (much much) easier to learn. I have fallen maybe 4-5 times total so far while learning on skis, whereas with snowboarding I fell at least 4-5 times per run in the learning stages. Ow. And that’s not counting falling when getting off the lift, which was at least half of the time. Oh, the bruises and aches I collected while learning! It took me at least five separate trips to various resorts to get the hang of snowboarding (meaning, linking smooth turns all the way down without falling), but with skiing I was able to successfully make it down the green runs on my first try. I’m not really counting the first time I ever skied when I was sixteen, although I was able to ski down the greens back then, too. I’ve read that snowboarding is harder to learn but easy to master, and that skiing is easy to learn but hard to master. I wouldn’t say I mastered snowboarding, but I did become proficient enough and I can agree with that statement – skiing is waaay easier to learn. But I can see how it’s going to take some more time to improve my skiing techniques, and I imagine the patience comes into play during the intermediate level. So if you’re new to snow sports and trying to decide what to try, maybe that will help. If you enjoy a challenge and have the patience to stick with it, try snowboarding! If you’d rather have an easier time with just getting down the mountain on your first day, maybe skiing is a good option. Or you can always choose to try both so you’ll know for sure which one you like better. I’m planning to put more time into skiing next season to work on technique.